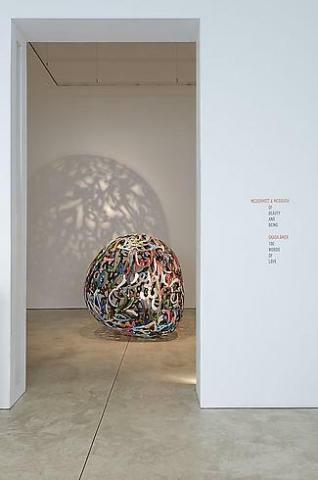 Cheim & Read is pleased to announce the exhibition of a new sculpture in the gallery's dome room, by Ghada Amer, entitled 100 Words of Love, 2010. The piece is comprised of one hundred Arabic words for love. Calligraphic inter-twining of letters creates an open, lace-like lattice form around a hollow interior. This work, like other works by the artist, reference domesticity, society, beauty and abstraction, and, consequently, the stereotypical gender roles found within these themes. Amer also addresses the Western media's portrayal of Arabic society as aggressive and associated with war. Having lived and worked in New York for over twenty years, Amer straddles both cultures - the Middle East of her youth and modern day America. The tension of this dichotomy sustains her awareness of how we see others and ourselves, and has been a long-standing influence on her work. Amer's work will also be on view simultaneously at Mathaf: Arab Museum of Modern Art, Doha.